…to like comic books, or LEGO, or Star Wars, or all three, even. The days of hiding your hobby so the other kids (or adults) won’t make fun of you are over, and “geek” is in. 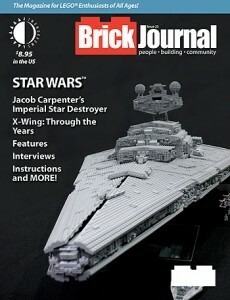 So embrace it, like thousands of Adult Fans of LEGO (AFOLs) have, and check out the new issue of BrickJournal. BrickJournal #23 (84 full-color pages, $8.95), TwoMorrows’ magazine for LEGO enthusiasts, presents the long-awaited STAR WARS issue! We use the LEGO Force as we spotlight adult top builders and their creations from a long time ago and far, far away, including Jacob Carpenter’s Imperial Star Destroyer (this thing is HUGE! ), Mark Kelso’s Invisible Hand, and feature a talk with Simon MacDonald about building Star Wars costume props with LEGO elements. We’ll also look back at the history of the LEGO X-Wing, from its first appearance in 1998 to the current version over ten years later. Plus: there’s our regular feature on minifigure customization by Jared Burks, AFOLs by cartoonist Greg Hyland, more step-by-step “You Can Build It” instructions by Christopher Deck, and other surprises. It’s edited, as always, by my buddy Joe Meno. You can view preview of the issue at THIS LINK. Or get the PRINT EDITION (at 15% off with a FREE digital edition) or DIGITAL EDITION ONLY (just $3.95) HERE. This entry was posted in TNT on 22 March 2013 by Mr. Morrow.